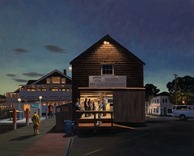 Bonito - Shore Stephen K. Sawyer, Jr. Final Awards Ceremony & Grand Raffle 1:00 PM Farm Neck Golf Club (OB). FREE & ALL ARE INVITED! Come to the Vineyard and fish The Derby! 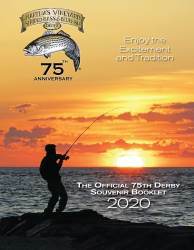 For nearly 75 years, "The Derby" has been a time to renew friendships, share a hot cup of coffee and create memories that fuel the winters exaggerated fish tales. It is a time when all can refocus on the natural beauty of this Island sanctuary. Come and be part of almost eight decades of great fishing, a rich history, meeting new friends, generous sponsor support, and beautiful sunrises and sunsets! Remember, Derby registration is open at all Island tackle shops and Derby HQ throughout the Derby! The Derby is one of the largest, oldest, and most prestigious fishing tournaments in the US - a New England Fall Classic since 1946! Featuring 3500+ Anglers, Boat, Shore, Flyrod, Junior, Senior Divisions, Daily, Weekly, and Overall Prizes and 5 Weeks of Great Fishing! We accept Product-Only Sponsorships and are a Registered 501(C)3 Non-Profit.